NB Have a read of Part II of this posting which is updated with new information. 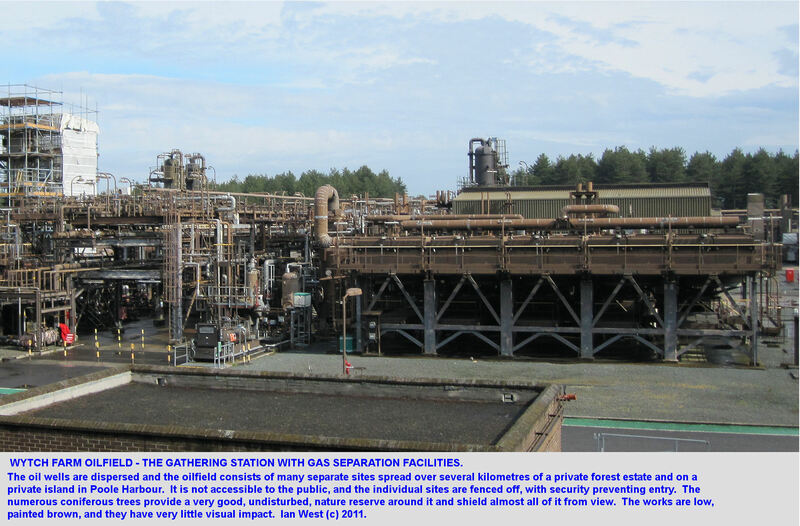 The oil production facilities at Wytch Farm in Dorset are often given as a model example of responsible fracking and justification of why unconventional gas should be pursued in Somerset and elsewhere, for example: The Telegraph’s The town where ‘fracking’ is already happening. If this is the case then why are people so agitated about the possibility of unconventional gas extraction in Somerset? How do the two compare? Dr Ian West’s pages at the University of Southampton web site are a good source of technical information. First, Wytch Farm is an oil field not coalbed methane production – which is the primary concern in Somerset and the Chew Valley. 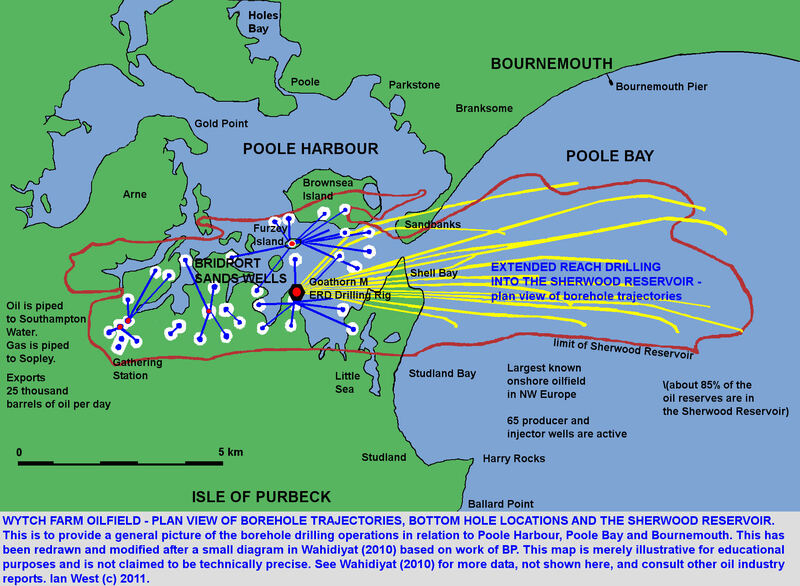 Secondly, whilst directional drilling and well stimulation have been successfully used at Wytch Farm the oil field is largely under Poole Harbour and the wells are on the coast, on Furzey Island or in Poole Harbour itself see – Wytch-Wells-Trajectories. 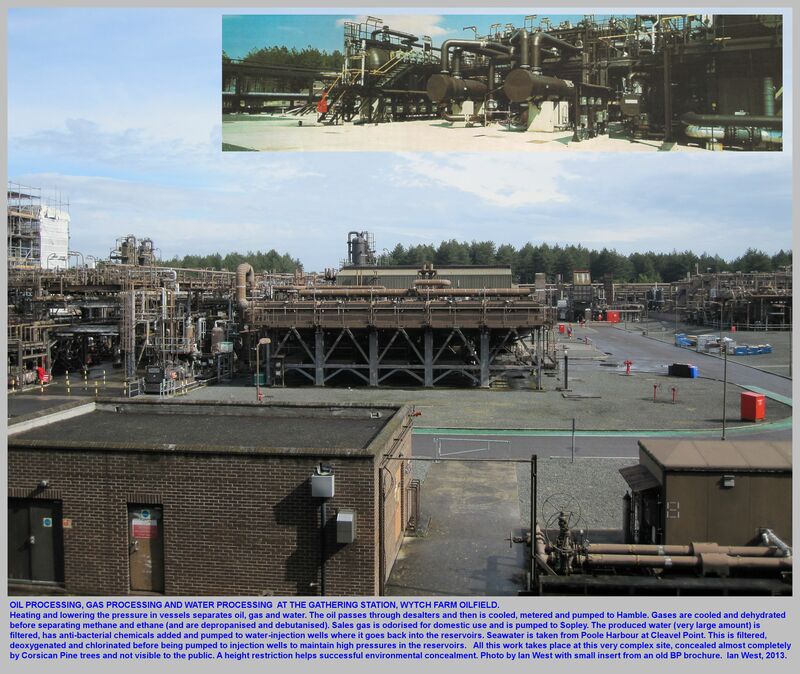 Extended directional drilling was necessary partly due to onshore opposition to drilling by the National Trust and the residential area on Hook Island. 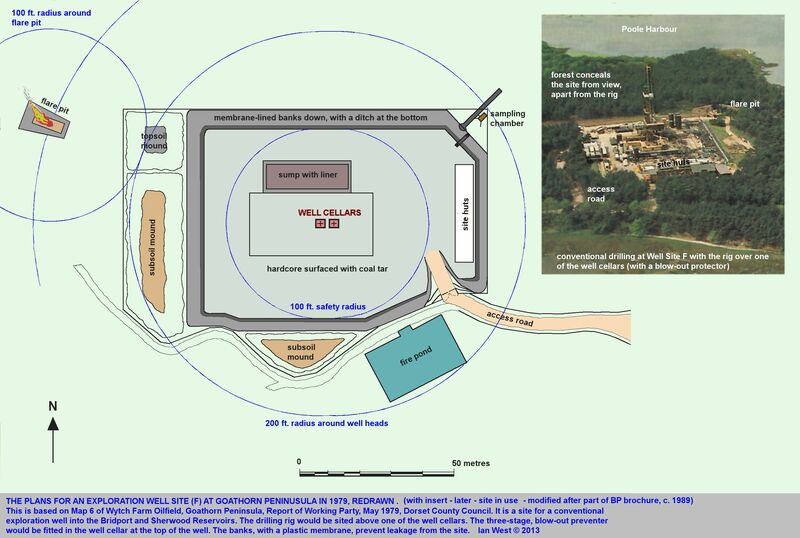 The wells are 1.6 km beneath the surface deeper than would be the case in the Bristol-Somerset coal field. Of the 199 wells drilled at Wytch Farm not a single one is classified as either Coalbed Methane or Shale Gas. The photograph in the Telegraph article shows only about 3 hectares (football pitches) of the Wytch Farm site which is actually about 18 ha in size. 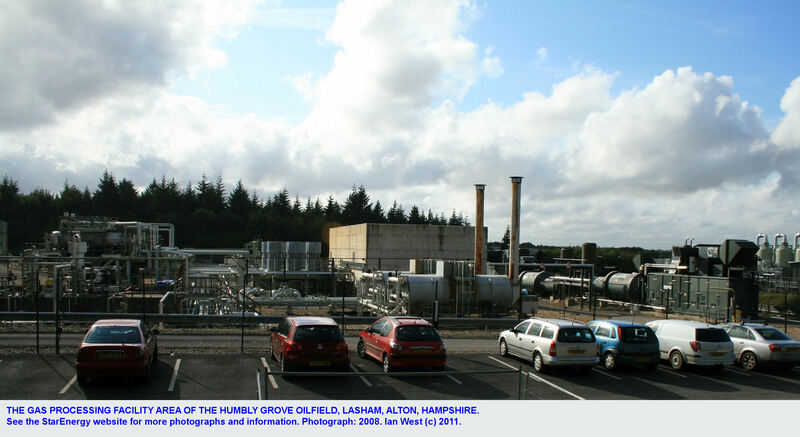 The facilities consist of well sites, extended reach directional drilling rigs , nodding donkeys, gathering station, oil gas and water processing, gas separation, and gas processing facilities (in this case at Lasham in Hampshire). 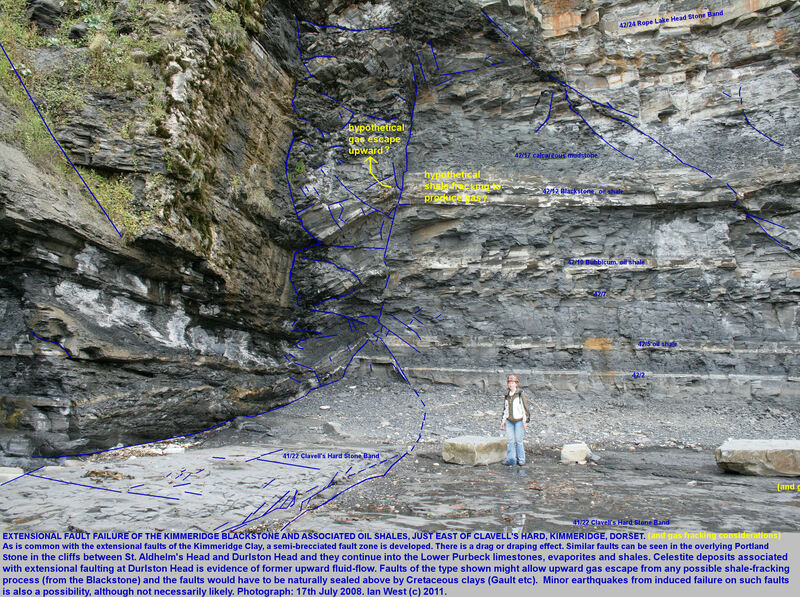 With regard to shale gas fracking Southampton University implies that it has not taken place in the Wytch Farm area, saying – “If fracking was ever to take place offshore in mature Jurassic shales of the Portland – Isle of Wight Basin…” and “… note onshore Dorset generally does not have thermally mature shale; the real prospects are only in the Jurassic basin offshore“. The University site also illustrates how gas can escape upwards along fault lines, a concern also in Somerset in relation to both hydrocarbons and Radon. Further, part of the Wytch Farm facilities are on Furzey Island in Poole Harbour and by definition nowhere near any residences. Other onshore facilities are surrounded by water on three sides and are again not near residences. There are no towns or villages within about 3km of any part of the site and it is not upstream of any major reservoirs. The number of residences (farms) near the site is very low. 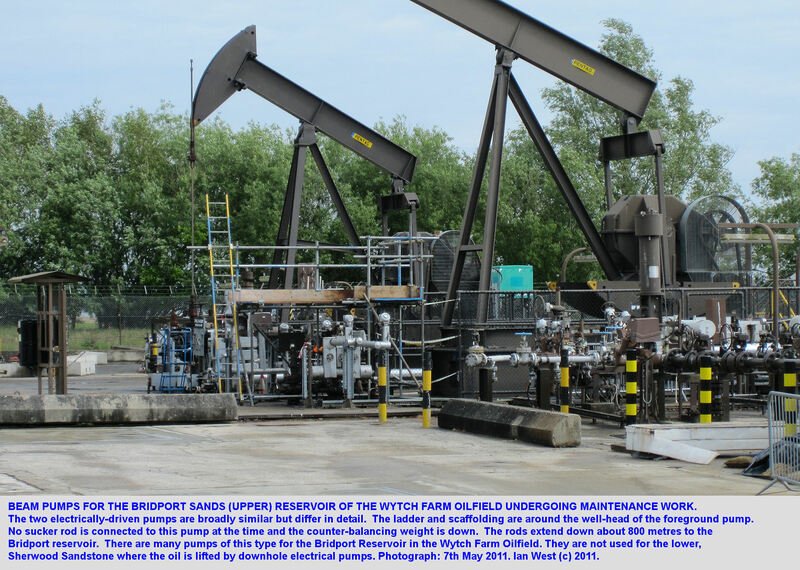 The Wytch Farm site is intensive as it concentrates a lot of production from under the harbour into a relatively small surface area by using multiple wells and extended directional drilling for up to 10.5 km beneath the sea. 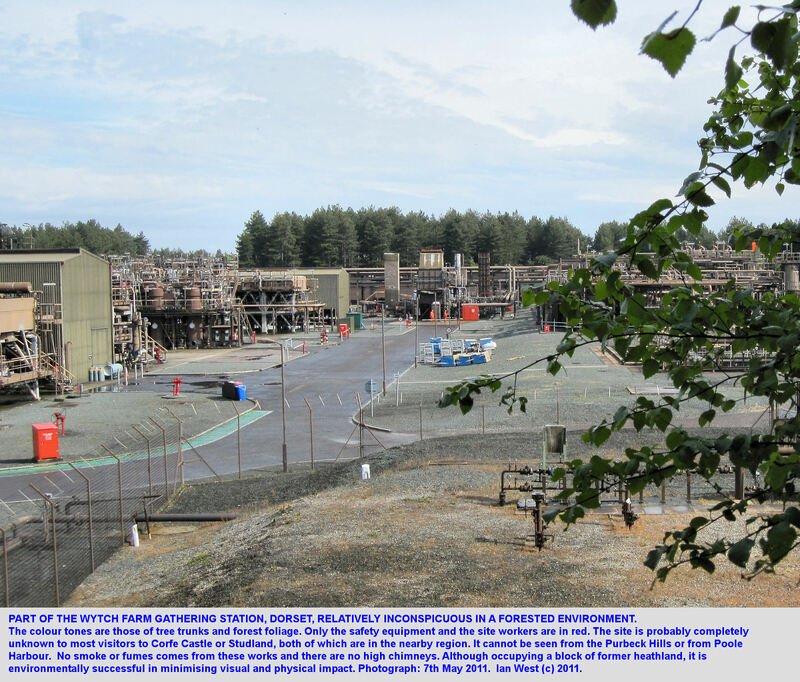 The whole site occupies about 18 ha of land – plus interconnecting pipelines, 3 km of private access road, 91 km of oil pipeline and 18 km of gas pipeline plus gas processing facilities elsewhere. Quite a major industrial complex. 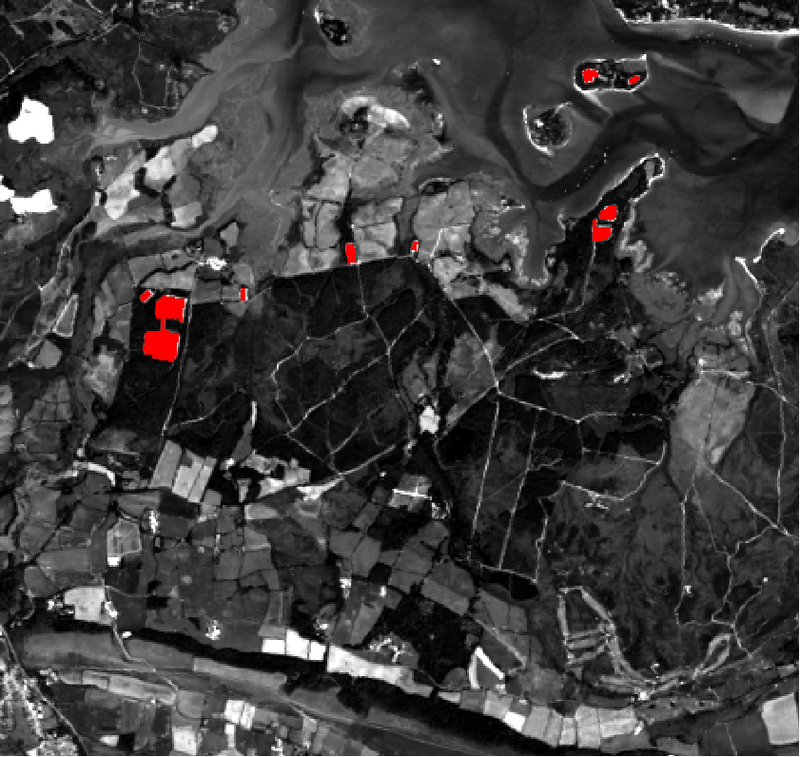 The image below shows the Wytch Farm oil facilities in red. Poole Harbour is to the north and the central dark area is woodland. Wytch Farm, Dorset. Oil facilities in red. This is a Landsat 8 satellite image captured on July 8th 2013. The image is 6.5km wide. 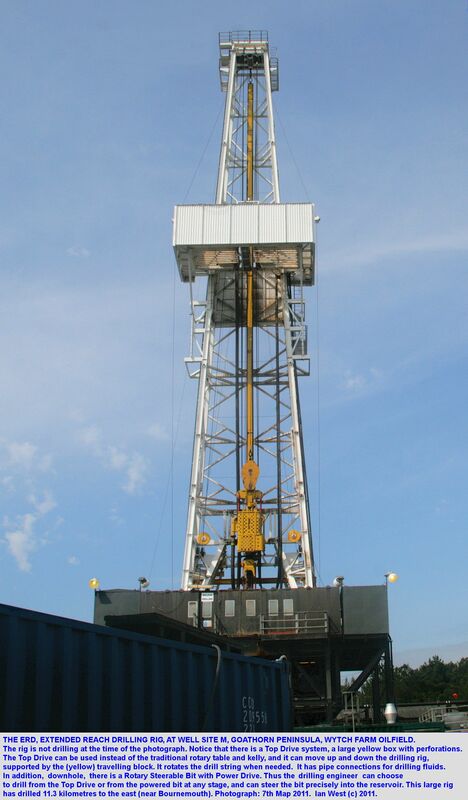 Coalbed methane on the other hand is an extensive activity as directional drilling is over short distances, about 400m, with a small number of wells per pad and requires many drilling pads spread across the landscape spaced about 750m apart. 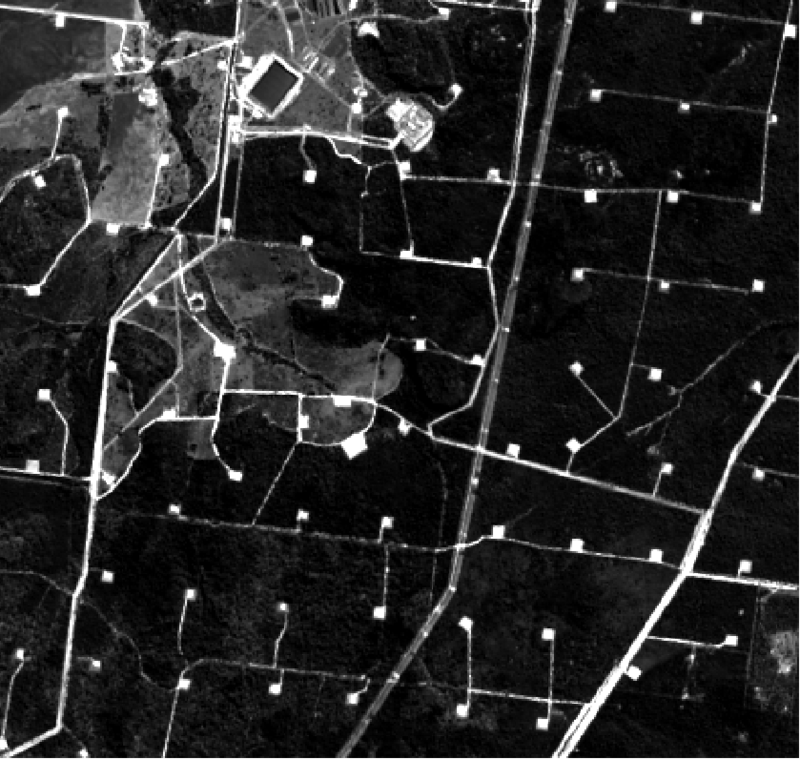 The image below is of a coalbed methane gas field in Queensland and is to scale with the Wytch Farm image above. The image has about 70 pads each of which is about 1 ha in size, plus access roads, pipelines and storage pits. Note that Caudrilla says their pads are 2 ha in size – twice the size of Lord’s cricket ground. Dark areas are woodland, light spots are gas well pads. This Landsat image was captured on the 27th May 2013. Q. 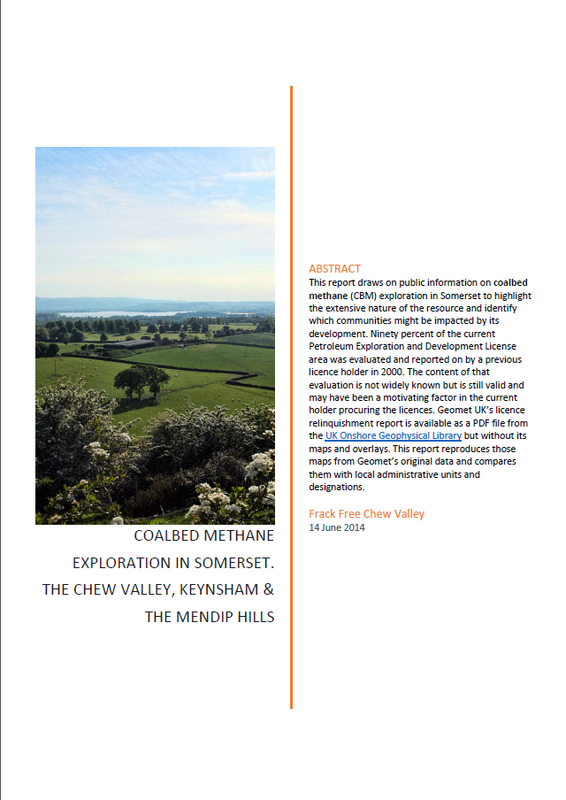 So is oil extraction from Wytch Farm a reassuring example for coalbed methane production in Somerset and the densely populated Chew Valley? A. No and the Queensland example is even worse. A screening of an hour-long film The Truth Behind the Dash for Gas by Marco Jackson for Frack Free Somerset, which shows how drilling for unconventional gas could affect the local area, will be shown in Ubley village hall on the 6th December at 7:30 pm. The Chew Valley is covered by two existing explorations and development licenses. Planning applications to drill for unconventional gas may be made at any time. Come to learn about local geological concerns, the potential industrialisation of the landscape plus threats to health and water supplies. Free. All welcome to share opinions and ask questions.